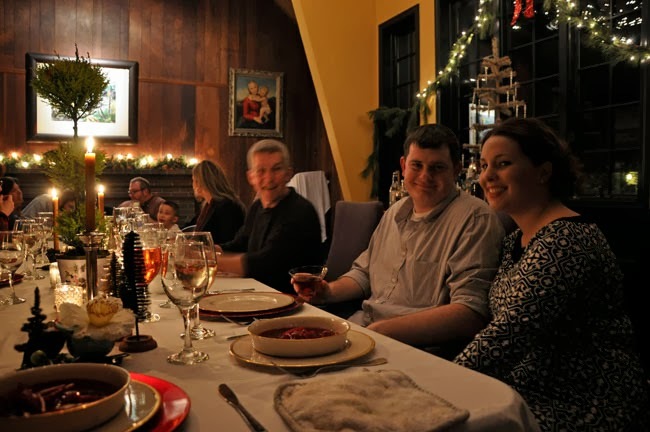 We had 25 guests last night for our traditional Lithuanian Christmas Eve dinner. Somehow, we were able to fit everyone at the same table, ( secret-it took two tables). My kitchen plant window, a little weak on white cyclamen and to be honest, I ran out of energy so I had to stick with some orchids, begonias and a few measly paperwhites that I found at Walmart - (it's official - Walmart paperwhites are indeed the measliest in the paperwhite kingdom). That fabulous wreath that looks as if it was made from Aloe leaves? Target, thank you very much! And it's made from dried seed pods. Clearly I wasn't very clever this year. At least I could splurge on camellias! 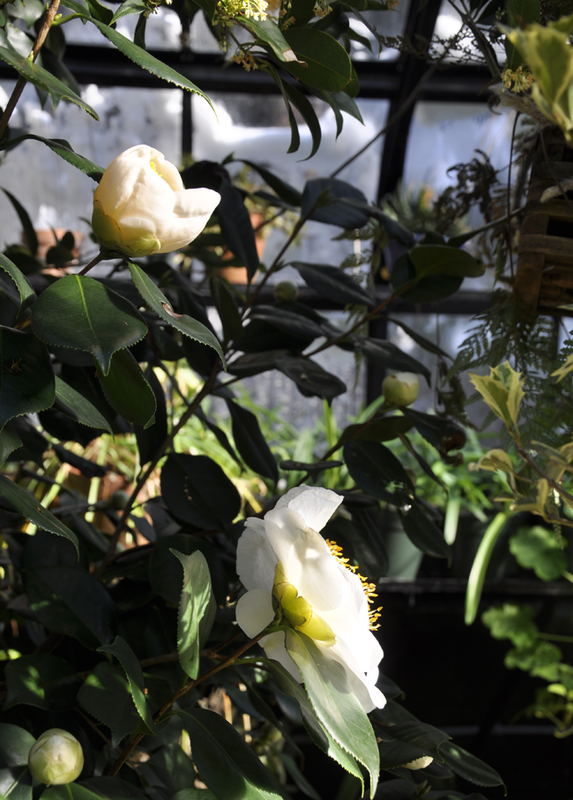 In the greenhouse, as large tree of Camellia 'Charlotte de Rothschild' that I planted into the ground of the greenhouse, provided a couple of dozen of its large, single white blossoms for our Christmas table. 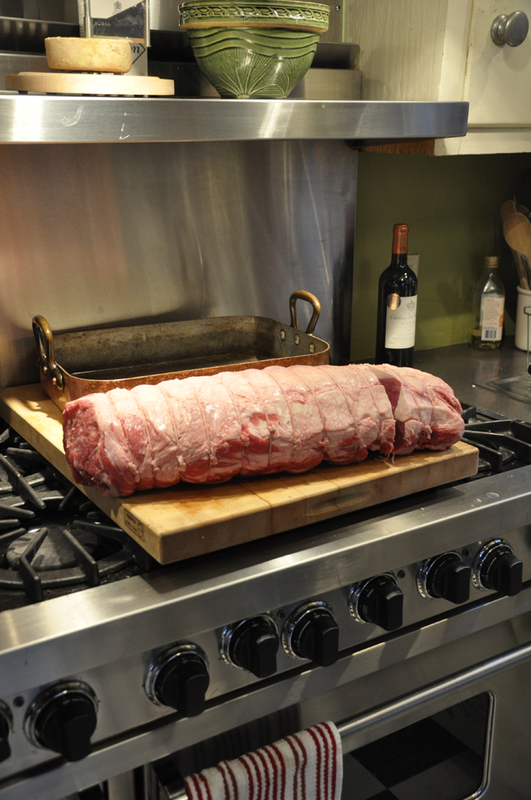 This year we served boneless Prime Rib of beef (we had two of these boneless racks, which I had the butcher prepare, trim and tie, since I knew I would be busy with other things). 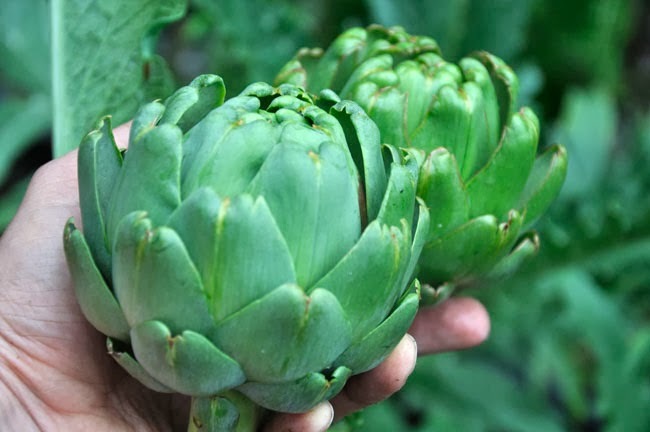 Along with simple, Mashed Potatoes ( yet not so light with cream and butter), winter vegetables and plenty of deserts, no one left any lighter than when they arrived. 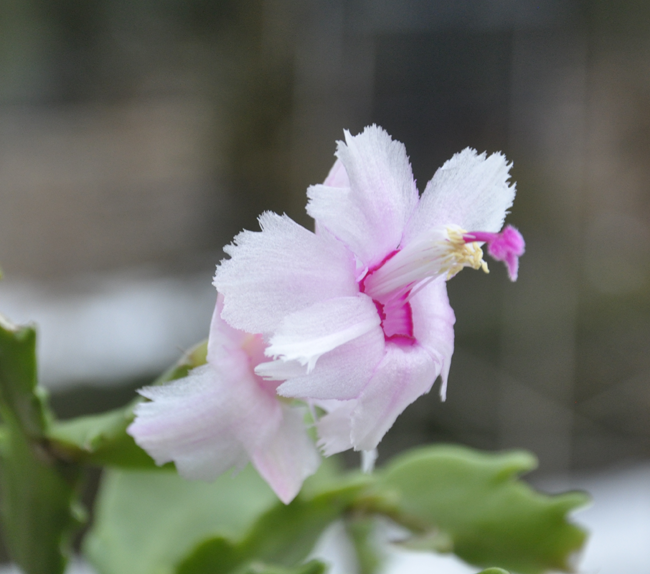 My poor, pathetic cutting of the Christmas Cactus known as 'Aspen', a highly sought after fringed form, bloomed with three flowers this year. 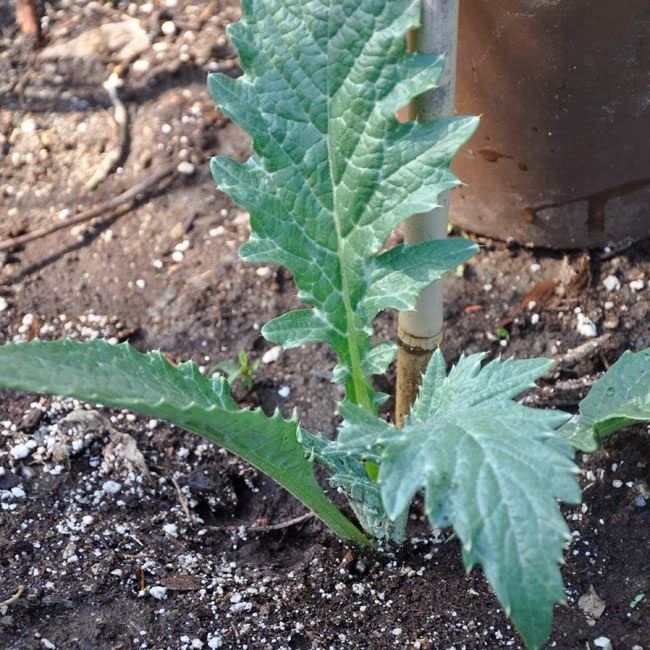 I call it 'pathetic' because I almost lost it this spring, when it rotted away to almost nothing in a damp corner of the greenhouse, yet I should call it my miracle plant, as it re-rooted in a new pot, and I re-discovered it last week in another cold corner (see a pattern here? ), but this time with a few buds. I had lots of guests bring desert, as I wanted to focus on the meal ( and Joe, on cocktails), but I wanted to share this one with you - a Japanese sponge cake with strawberries and cream by my good friend and cake designer, Jessica Rosenkranz. Nothing like taking on a difficult task! 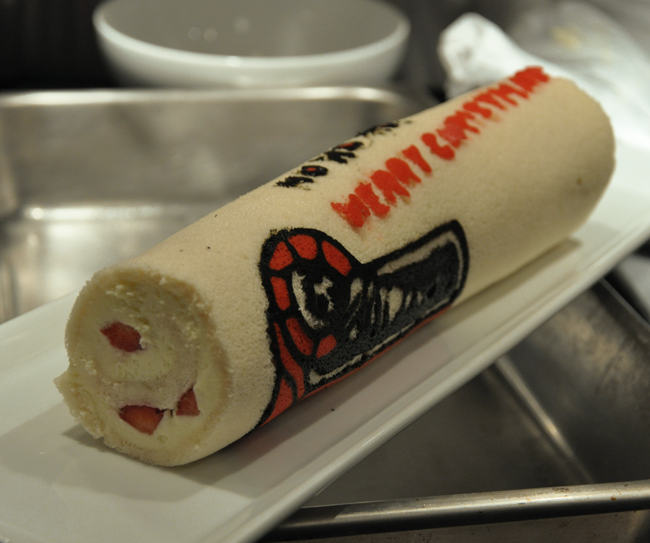 She admits that it was her first time trying Japanese sponge, but I think it came out pretty sweet. And it tasted good, too, filled with berries and cream. 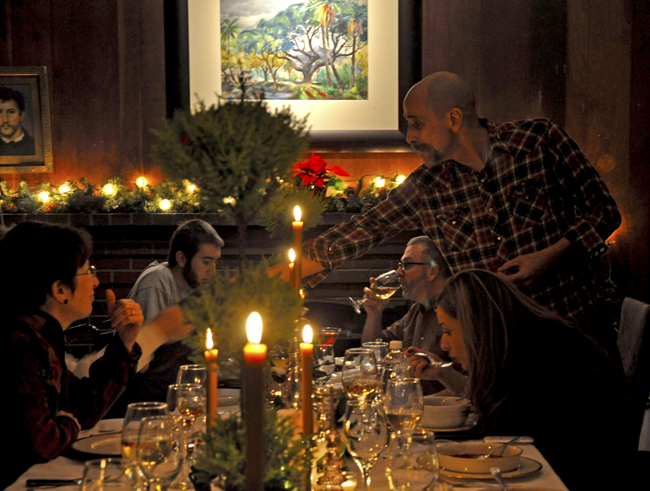 Joe topping off glasses, ensuring constant joy. My older brother Bruce, in the center, and my nice Lyndsey and her Husband Davis on the right ( they just celebrated their first wedding anniversary two weeks ago). There was a time, long before those brilliant red silk poinsettia at Michaels ( complete with faux gold foil on the pot), and dwarf Kalanchoes, paperwhite Narcissus or white Snowflake Hydrangea's when the only source for Holiday plants was the local florist, most likely one with a snow covered, glasshouse attached, or, if you were wealthy, from ones own greenhouse,where winter-blooming shrubs and plants cultivated by ones gardening staff could be brought into the conservatory or plant windows for temporary display for Christmas. 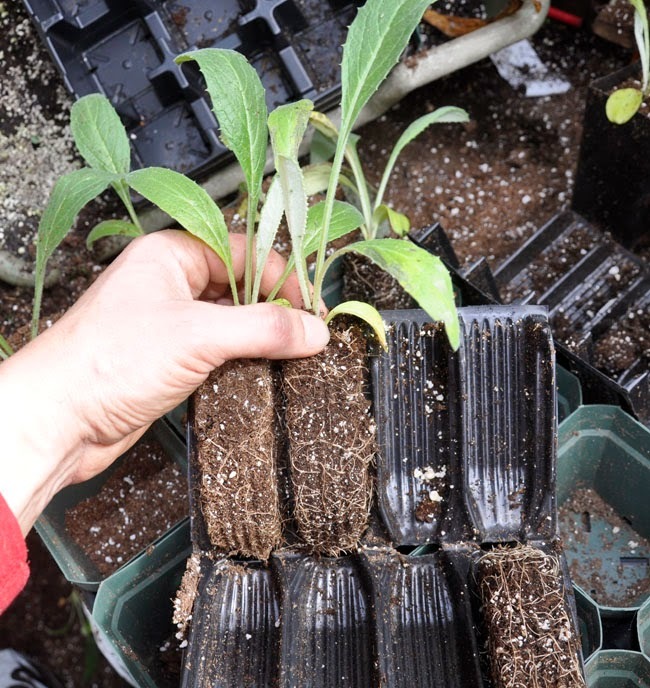 I have to admit that I have a weakness for 18th and 19th Century conservatory plants and growing techniques, perhaps because I am blessed with a heated glasshouse in New England, but more so, because of the rich horticultural heritage which exists from this time period. A time when plant explorers from England (and even a few from the US) travelled by ship to far off lands such as China, Japan and South Africa in search of new species to grow in these relatively new structures called 'stoves', glasshouses or greenhouses which suddenly offered the ability to grow tender plants and produce like grapes, nectarines and pineapple for the winter estate table. Lily of the Valley pips, forced here from roots that I dug in the garden this past fall, and forced in a window, will provide a fragrant display more reminiscent of Christmas 1885, when Lily of the Valley pips were shipped to New York City by the thousands to decorate store windows and Holiday tables. Here in the Boston area, many glass and wood greenhouses still exist, but not as many as when I was a child in the 1960's, and even fewer than when my father was a child, in the 1910's. He remembers local greenhouses here in central Massachusetts where camellias were available throughout the winter for a corsage for a Holiday party or a freshly picked bunch of fragrant violets, once so traditional as a Christmas flower, long before the poinsettia's of the 20th Century made their debut. 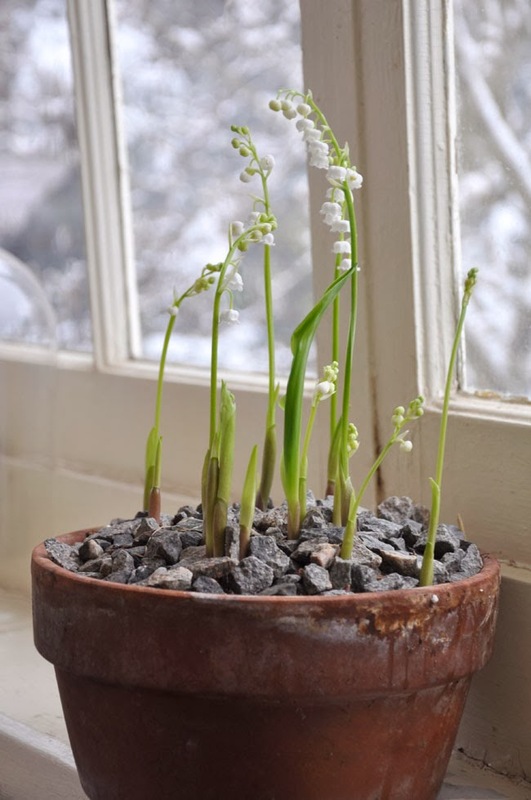 Those of you who read my posts often, know that I love old-time plants My obsession with Victorian plants and their cultural techniques keep my plant collections unique, with most additions coming from old estate greenhouses or from long searches on-line, as I try to find lost cultivars of Clivia, Acacia species, rare bulbs and many other plants which were once so common in any cold northern greenhouse in London or the North Eastern US. 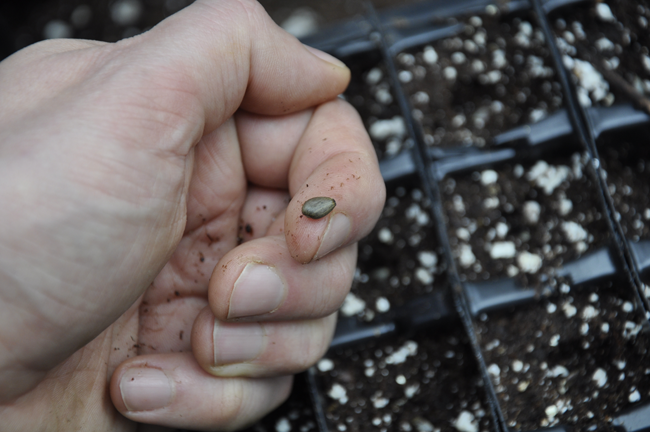 Once in my greenhouse, these plants often perform with surprising regularity, as if they know a secret. Blooming at precise moments of time often dictated more by the moon and Earth's seasonal cycles, than by chemicals or artificial daylenth with lights. So although my Christmas cactus or Cyclamen may appear to bloom at different weeks each year, at least they all bloom at the same time. 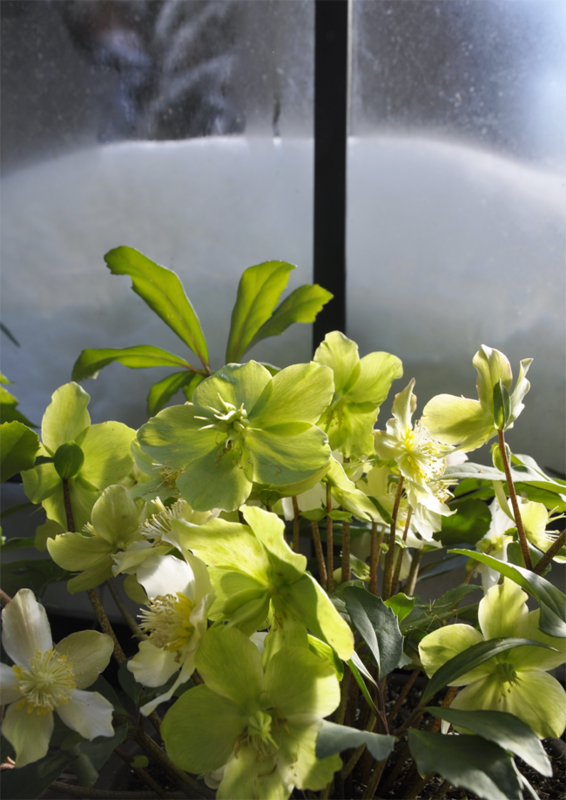 White Hellebores, once known as Christmas Roses were the traditional Christmas flower in much of Europe before commercial crops and warm, dry furnace-heated air in modern homes made them impossible to keep alive. 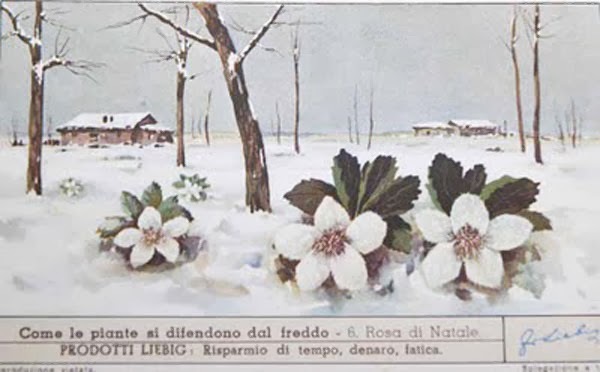 White Christmas Hellebores or Rosa di Natale are features on this Christmas card from Italy dating from 1880. 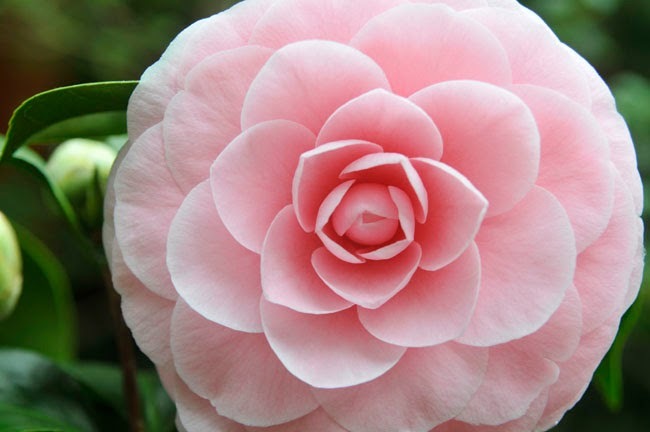 Camellia's were once standard florist plants in areas where they could not be grown outdoors. 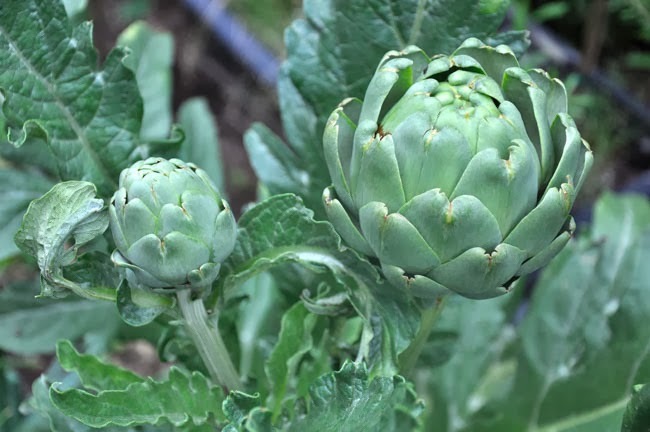 In the North Eastern US, they were not only common throughout the winter holiday season, but essential as a corsage for Christmas Eve mass or for a Christmas table display. 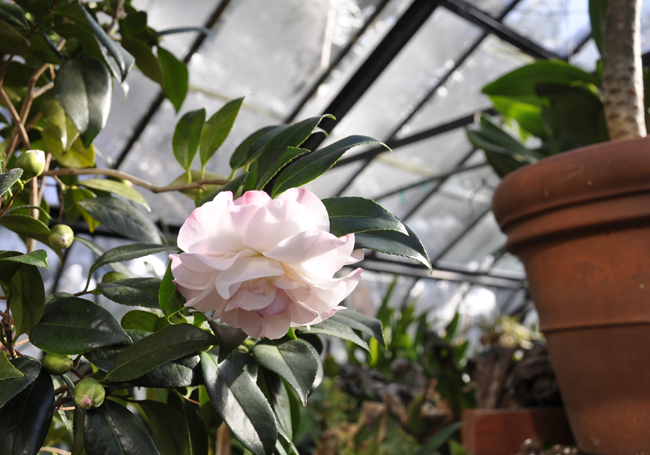 In my greenhouse, which is kept relatively cold with a nighttime temperature of 40º F., here the classic vintage shrubs and plants like camellias, Daphne odorata, Buddleia asiatica, Osmanthus fragrans, Lily of the Valley, winter bulbs and Correa all bloom during these shortest days of the year. 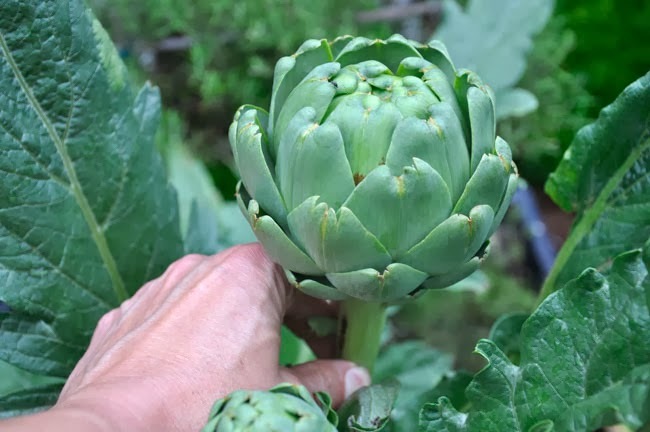 and each becomes a living bit of history for me, whenever I enter the greenhouse in the December and January, as if one could smell a scene in a painting or an old photograph. 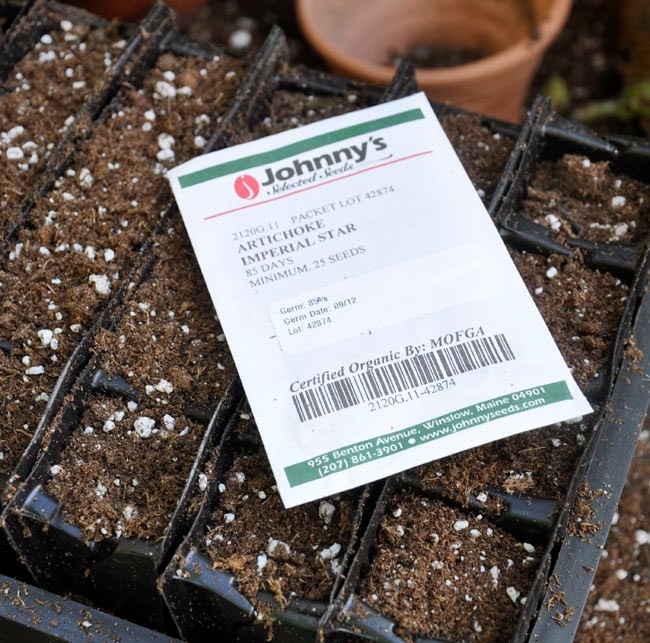 I can imagine a country gentleman from 1805 appreciating exactly the same scent, perhaps even from the same plant, and many of these ancient greenhouse conservatory plants came from cuttings collected from old estate greenhouses here in the Boston area. 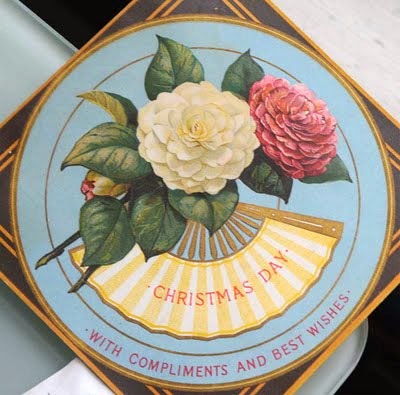 Camellias and Hellebores were common illustrations on turn of the century Christmas cards, where they appeared along with other common early winter plants such as cyclamen, scented violets and Lily of the Valley. Single white or red Anemone's and Ranunculus were also common cut flowers available from local greenhouses during the Christmas season. 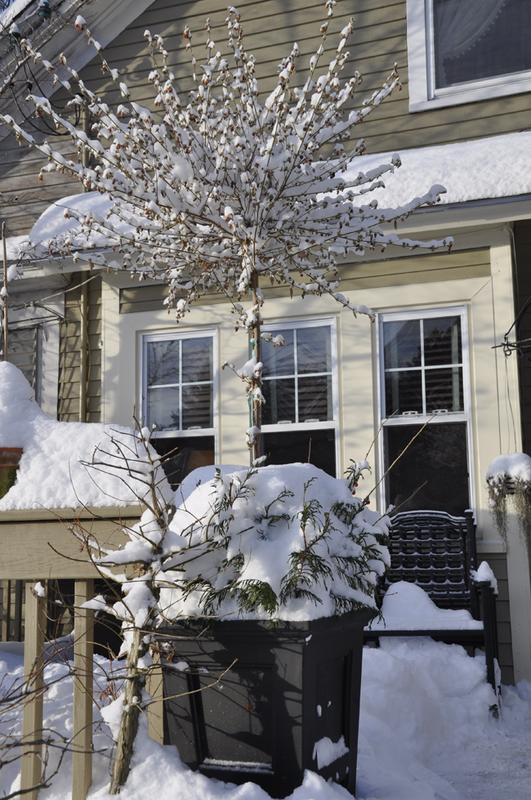 Along with twigs of broad-leaved evergreens like holly, boxwood, and needled conifers such as spruce, pine and fir, and a truly authentic Chistmas arrangement could be assembled. 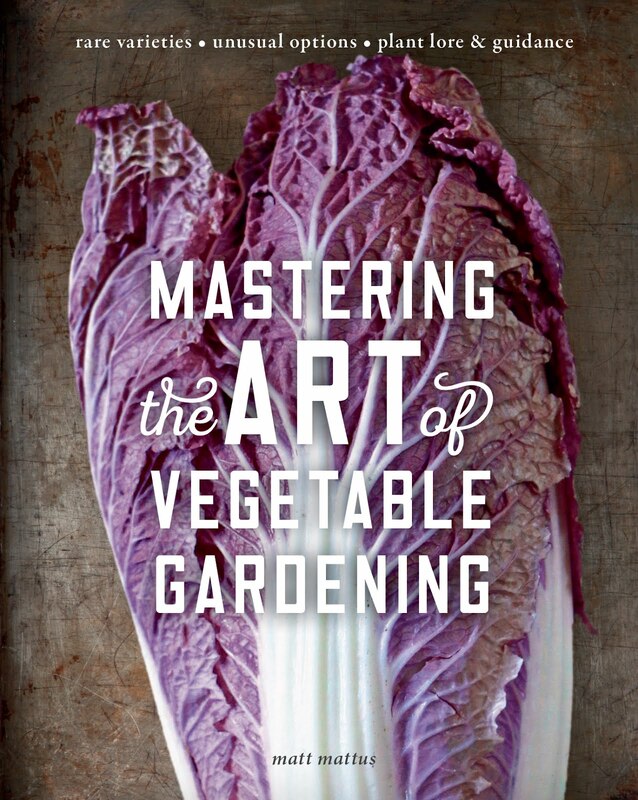 In the days of Lincoln and Downton Abbey, such plants and flowers had to be grown locally. 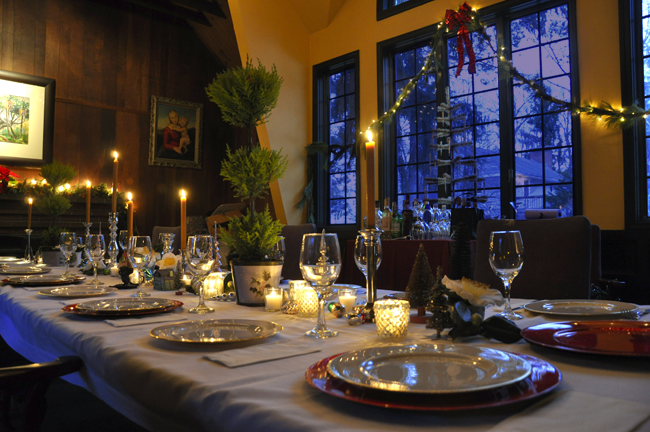 Pinecones, acorns, nuts and seeds, woodland plants such as mosses, ferns, berries and branches, along with ornamental grasses, feathers and dried flowers, fruits such as oranges, pineapple, lemons, limes and apples rounded out the Christmas displays of the period. One may not associate florist Carnations with the Holiday season, but here in the Boston area, and throughout the eastern US, the Carnation was traditionally available long before air travel opened up a global market. Once a major commercial greenhouse crop in the 1800's. and 1900's here in New England, growers raised millions of flowers which were shipped by rail across the entire Eastern Seaboard market. Along with greens from the greenhouse and garden, here all picked from my garden and from the greenhouse. 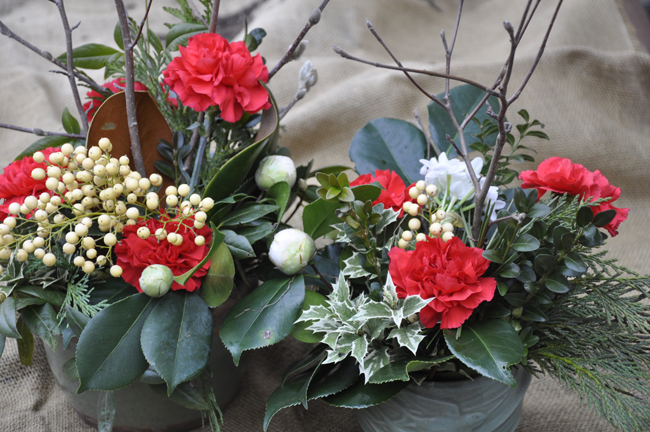 Glossy Camellia foliage along with a variegated Osmanthus, which looks a lot like holly, boxwood, cedar, magnolia bud and foliage and some white Nandina domestica berries. 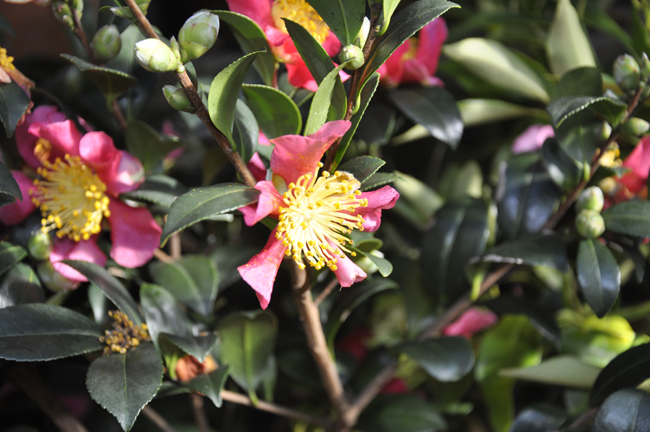 A relatively new camellia to the scene, 'Yuletide', was bred at the California nursery Nuccio's, using some traditional single Japanese sassanqua camellias in an effort to bring earlier or mid-season blooming to the camellia grower. 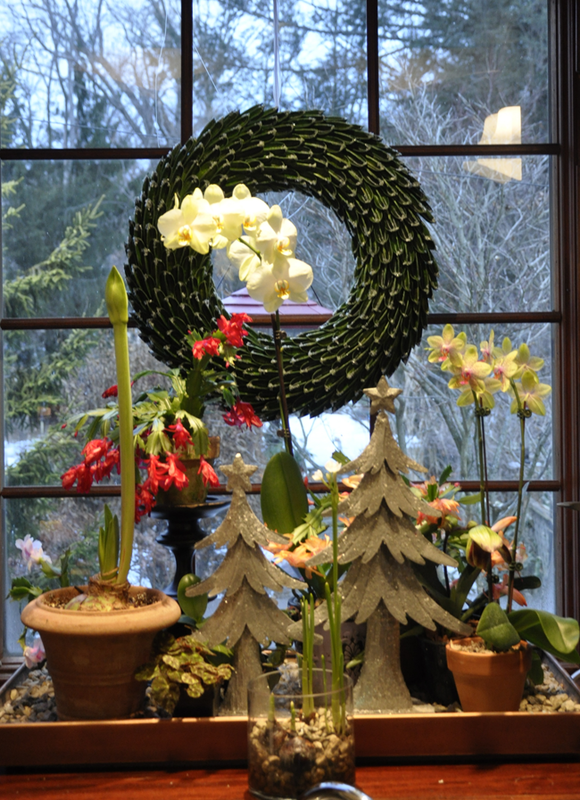 Today, it is a standard Holiday feature, not only because of its name, but because it is always in bloom for Christmas, making an annual appearance in small vases throughout the house, and on the Holiday table and food trays on Christmas Eve. 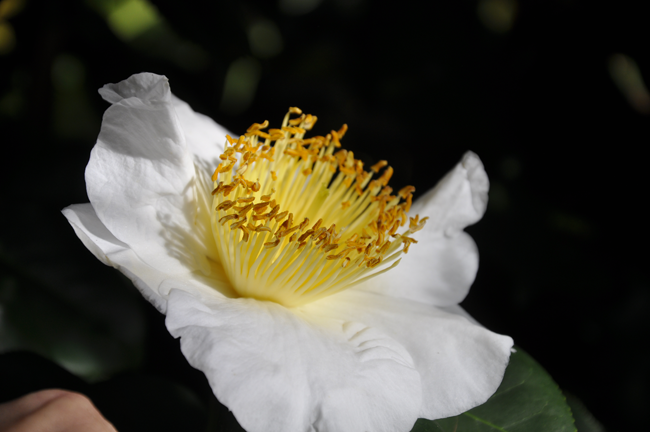 After two blizzards this week, it's always welcome to see winter camellia's in bloom, as my collection grows larger with each year, the pots and tubs grow heavier, but so does the bud count which means more camellia's to pick for events. 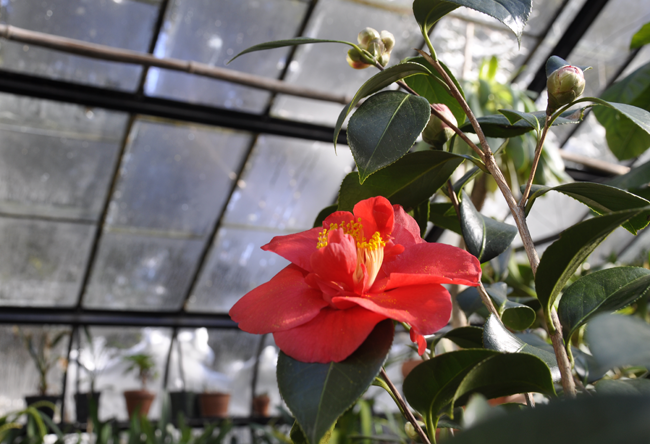 I've lost the name of this single species Camellia, but planted in the ground in the greenhouse, it has grown quickly, so high in 9 years that I had to cut it in half last week, so that the fans could circulate air more efficiently. 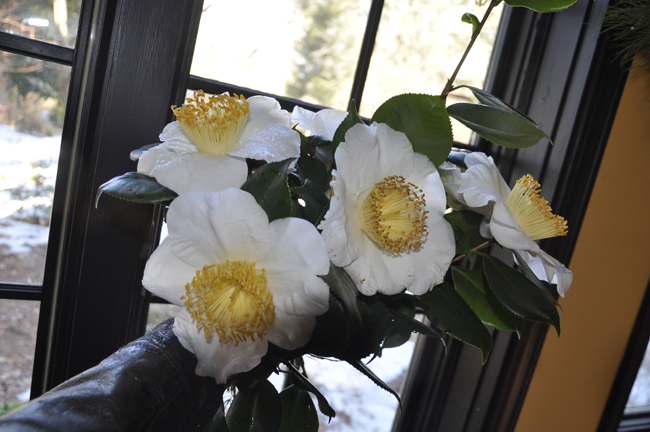 In the past, I have used this camellia in temporary Holiday wreaths, a luxurious abundance of flowers seems to happen every few years. Just to prove that not all is perfect in my life - many plants never made it back into the greenhouse this autumn, such as these standard topiary abutilons on the deck. 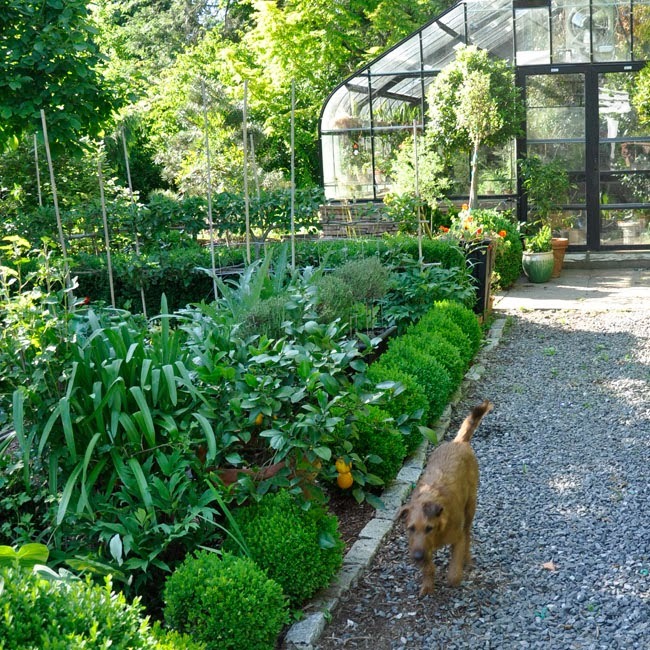 It was just all too much for me, and I admit that the large bay laurel standard topiaries just made it into the protection of the greenhouse two weeks ago! On a side note: Check out my new project - writing a column for the mens lifestyle site Stylenochaser. 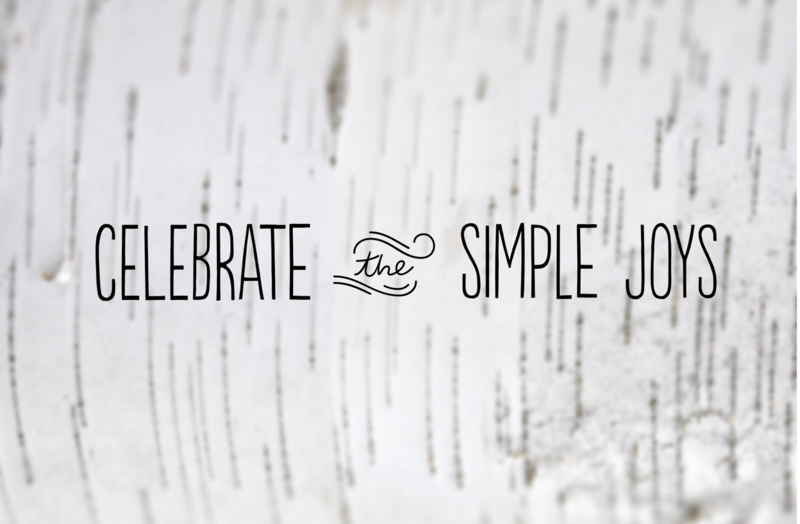 We all can become stressed during the Holiday season, trying to be perfect ( my big problem), driving everyone else crazy with to-do lists, things the bake before it is "too late", even trying to rather simple tasks such as getting t packages out to the post office can seem overwhelming - but sometimes, letting things go a bit, taking the time to appreciate the moments, can make a crazy time of year, much more bearable. I mean, who cares if there is a half of a Hubbard Squash frozen on the back porch - I mean, who knew that the temperature was going to drop to January sub-zero levels over-night? Sure, it was -5º this morning, and sure, I am having some nasty greenhouse heating issues, but we have so much to be thankful for - like the first flocks of goldfinches on our thistle feeders, bright violet calicarpa berries at the same time as red holly berries, even soft, white fluffy snow guaranteeing a white Christmas here in New England. 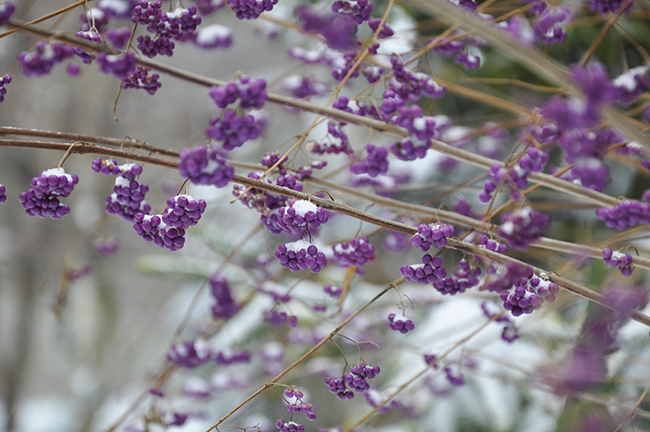 So…a few images from a walk in the garden on this snowy, December day. Just appreciating the little things, and who cares if I never got to make those wreathes. Maybe next year. Beatrix Potter themed Holiday gifts! 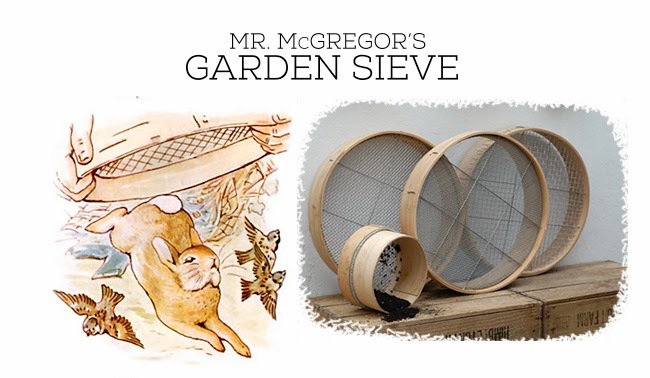 Traditional Beech Wood Garden Riddle (Sieve) made by Hill & Sons in the UK, a product they have been manufacturing by hand since 1946. These classic riddles are classics, and if you can get one into your collection you would be in good company ( with Prince Charles, Alan Titchmarsh and Kew Gardens). They are difficult to find outside of the UK, but one can find them on the UK Amazon site. My advice? Find a friend in the UK, have two shipped to them - they keep one, and then ship the other one to you. 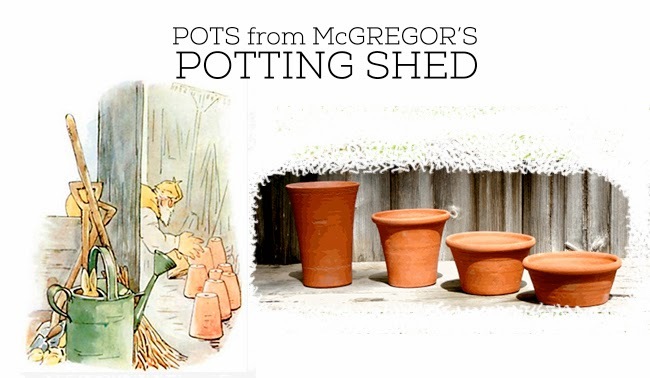 Garden sieves are more likely to be found in only the most serious gardener's potting sheds, as few others know what to do with them. 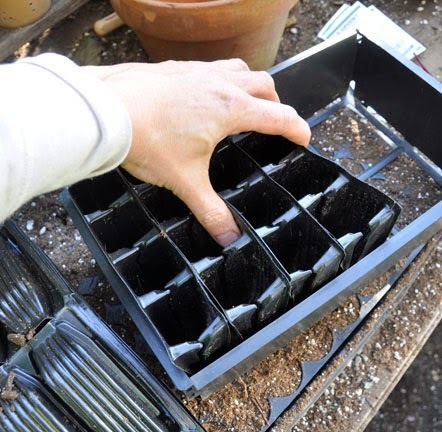 I find them useful for sifting compost, and when repotting bulbs in the greenhouse, but aside from those more practical uses, a nice wooden one would make a terrific harvesting basket in which to dry garlic or onions, or to trug around produce back from the vegetable garden. Of course, if you have a rabbit or sparrow problem…. 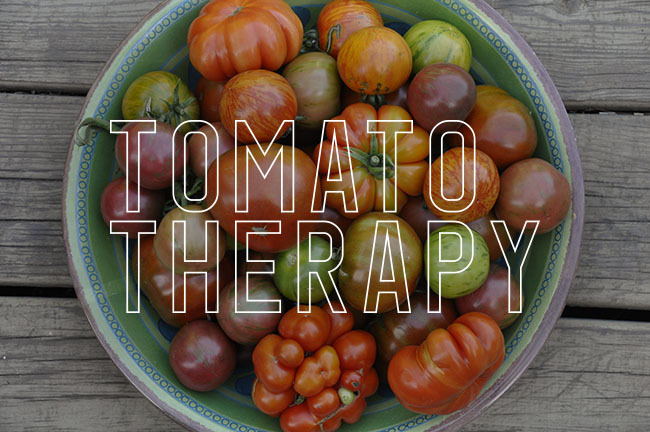 More ideas below, plus, even more here on HGTV Gardens, who so kindly featured my blog on their Garden Blogger Gift Guide post! How cool is that! 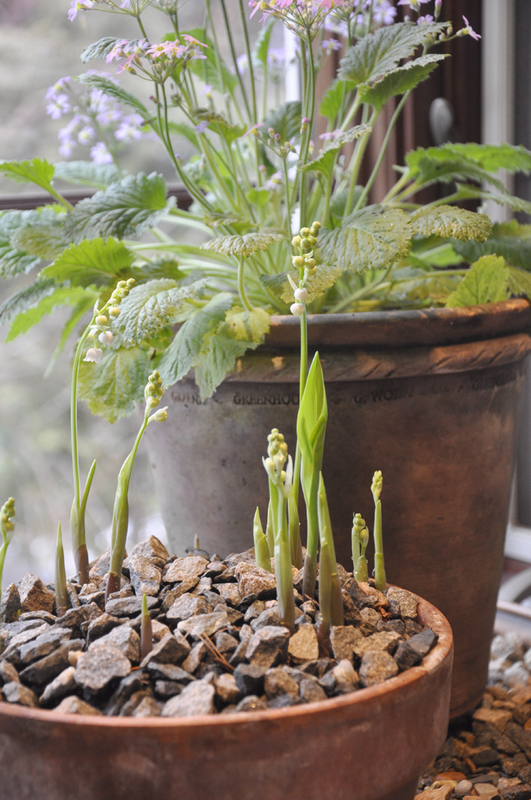 Guy Wolff pots come the closest to those seen in most every Beatrix Potter garden illustration. One can never have too many of these treasures. Let's face it - we can never have enough pots made by the talented potter GUY WOLFF!. Of course, there is his son, BEN WOLFF, equally talented, and a handful of other potters making similar pots. I can't help myself each year, and try to buy the biggest GUY WOLFF pot that I can, for they are not only important American made artwork, they are highly collectable and cherished by any and all gardeners. One can buy original hand made pots by Guy via his website, or one can purchase less expensive ones made by casts, or by other potters in his guild worldwide.